Surgery: To remove all or part of the tumor. Radiation therapy: High-energy rays which are used to kill or damage cancer cells. Chemotherapy: The use of certain medicines to treat cancer. Developmental therapeutics: Making new treatments available for difficult-to-treat cancers. A child with a rare tumor may undergo any one of these treatments or a combination of them. Our team is committed to advancing research and medicine by developing new techniques, treatment and cures for children and young adults with rare tumors. We are home to one of the largest clinical trial programs in the country—offering our patients access to some of the most novel treatment options in the country. We are home to one of the leading childhood cancer programs in the country. Combining the latest proven technology and research with a caring, child-friendly approach, makes the Aflac Cancer and Blood Disorders Center a top choice for the treatment of rare tumors. U.S. News & World Report ranks us among the top pediatric cancer programs in the country. 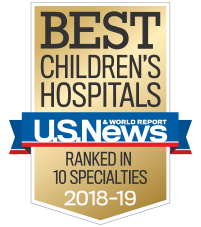 We are the pediatric component of the Emory Winship Cancer Institute—a National Cancer Institute-designated cancer center. We offer some of the most promising new cancer treatments for children who have relapsed or who have difficult-to-treat cancers through our developmental therapeutics program. Learn how to prepare for your visit to the Aflac Cancer Center, including information about our transitional housing options for families traveling from outside of metro Atlanta. Camps, retreats and other events offer many therapeutic benefits for children and families who are dealing with serious illness. We understand you want to be certain your child is receiving the best possible treatment available. Second opinions can help provide the information you need to make an informed decision about the best treatment for your child. For families traveling outside the U.S., we are here to help meet your unique needs and challenges. Learn how you can help make a difference in the life of a child battling cancer or blood disorders. Call 888-785-1112 or 404-785-1112 to make an appointment.